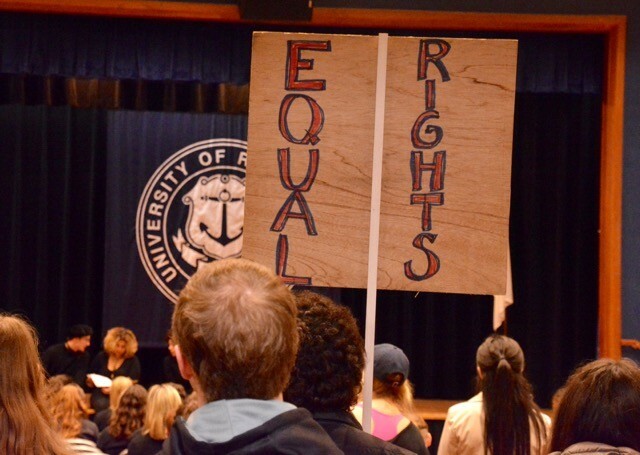 Following the results of the presidential election, students and faculty at the University of Rhode Island gathered on Tuesday to express solidarity for one another, as well as their concerns and hopes for the future. 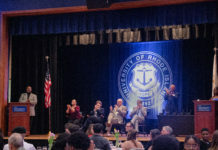 The event, which was originally scheduled to take place on the Quadrangle, was relocated to the Memorial Union Ballroom due to inclement weather. Inside, students and faculty members gathered into what would be standing room-only for most of the three-hour event. With more than 300 members of the community in attendance, some of the crowd was forced to spill out into the lobby. Organizers of the “Walkout: A Statement of Student Solidarity, Hope and Safety” said they hoped the event would be viewed as a chance for everyone to “express their collective grief, concern, anxiety and hope following the election.” Planned in conjunction with students from multiple academic disciplines, nationalities and beliefs, the event was not intended to be an “anti-Trump” rally. Holding true to the event’s vision and high ideals, of the nearly 40 members of the community who chose to speak, president-elect Donald Trump was rarely mentioned by name. Instead, students spoke of love, understanding, tolerance and the action needed to protect the rights of others. Members from the Muslim Student Association spoke of the acceptance they have found on campus and the America they have come to know sitting before them. Political science majors urged the importance of remaining well informed and involved in politics, despite the fact that many first-time voters were upset with the results of the election. Mostly, however, students from a wide array of nationalities, sexual orientations, religions, immigration statuses and majors emphasized the importance of supporting others – especially those marginalized on the campaign trail. Tuesday was a somber occasion for some of the audience, but many said that their collective sadness would not solve the nation’s issues. The peaceful gathering did not face any opposition in person but has since been met with some backlash on the Internet. In a comment on the Providence Journal’s write up of Tuesday’s walkout, URI health studies major George Al-Amir expressed criticism for the event. “I went to the event, my favorite part was when some kid bragged about being an illegal immigrant,” Al-Amir wrote. When The Good 5 Cent Cigar reached out to Al-Amir for an additional comment, he said he went to the event to check it out, and that it was what he expected it to be. “A lot of students [were] scared because the media has brainwashed them into thinking Trump is the second coming of Hitler, and they’re all gonna die now that he’s elected,” Al-Amir said. Individuals on both sides of the political aisle have seen recent protests and riots around the country as destructive, hateful and ineffective, which is why student organizers wanted to gather peacefully. Many students who chose to speak expressed similar sentiments- that they were not protesting the results of the election, but were standing up and speaking out for the rights of others. Not all speakers chose to focus on the same issues or concerns, but everyone who spoke shared one unifying theme. That this isn’t the end, but only the beginning.